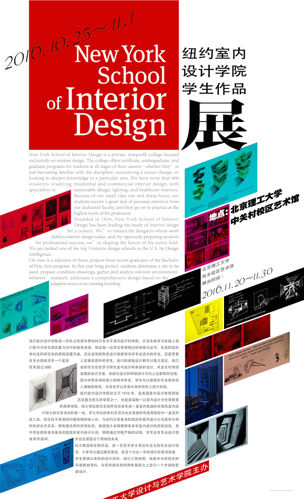 Exhibition of the Design Works by the Students from New York School of Interior Design was open in the gallery of Zhongguancun campus of Beijing Institute of Technology. Founded in 1916, New York School of Interior Design is one of the oldest universities of interior design education and the only higher education school that set interior design as its major in the United States. The programs of interior design by postgraduates have been ranked the first of all universities in the United States, and the programs by undergraduates has always had a higher ranking.